The most common and probably most essential process. Within this service, we clean the underside of the vehicle down removing any loose debris, dust and loose rust. 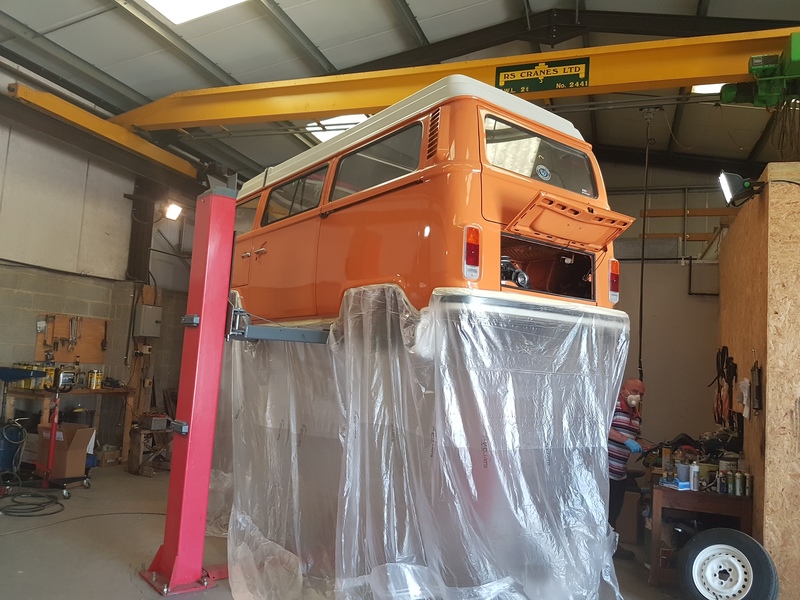 Once clean we spray a good layer of Black Wax-Oyl, clear wax can be used if the underside of your van is nicely painted, which gives the underside a spongy yet tacky finish. This means it won't dry and chip off like other underseal products, the sponginess helps deflect road debris and the waxiness of the coating prevents water and road salt from sticking or remaining on the underside of the vehicle. We recommend that if you are using you VW in the winter to regularly rinse the wheel arches (not jet wash) just to wash away any residues and keep the coating clear to do its job. It is advisable to re-apply this every 3-5 years depending on the amount of usage. Often overlooked but can be as preventative as waxing the underside. In this process we pump Clear Wax-Oyl into each of the vehicles chassis cavities, sill areas, front and rear valances, door bottoms etc. The aim of this is to prevent moisture from condensation from settling on the metalwork and causing it to rust. The wax stays soft and on very hot days can be seen dripping from some areas. Don't panic, this is a good thing because it means it has softened enough to become fluid and is more likely to fill all those nooks and crannies and prevent water getting in. Ideally this also needs to be re-applied every 3-5 years, depending on the amount of outdoors time it has. Our preferred method of application is to apply both underside and cavity waxing in one go, this means your vehicle is protected, in all the places we can get it, to the same level of protection. This means you can apply and forget for the next few year until it needs doing again. We offer a discount for combining both waxing services.